The baby booties cake was a 10 inch chocolate cake covered in fondant with fondant accents. I truly enjoyed making the booties out of fondant most of all. 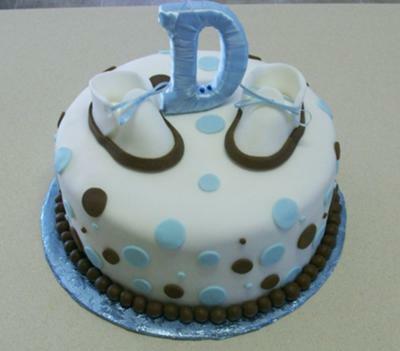 The letter D was initially created in fondant but the fondant had not harden by the time I was to delivery the cake. Think, think, think, I went to Michael's and purchased a D in foam board and wrapped in ribbon. Nice cake Anna! It is looking so decent. The idea of making baby booties on the cake is really creative. The most beautiful thing about the cake is the "D" that you have placed on it. Really nice! If you're going to feed it to your baby then I must say you should check for the ingredients first and should make sure it is good for your baby. Well Anna check below to find more info regarding baby products and foods. Healthy Organic Baby Products. Thanks for sharing. When you mentioned the name of education, the first thing that comes to mind is colleges and universities. Education provide everywhere at any time. We are here for your academic help so you should to visit this essay center custom writing for your educational work. Great job! Your cakes are getting better and better!